Large estate set in beautiful countryside close to Migjorn beach, just 10 minutes walk. Large open plan kitchen dining room. Living room with sliding doors to large wooden decking terrace. Air conditioning. 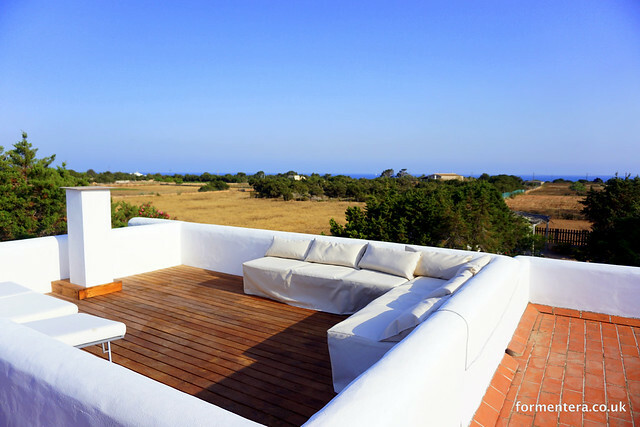 Roof top sun terrace with chill out and sea views. Bedroom 1) Double bed, ensuite, external doors to terrace. Bedroom 2) Twin beds with external doors to terrace. Bedroom 3) Annex bedroom to side of main house, ensuite, external doors to terrace. Bedroom 4) Annex bedroom to front of main house, ensuite, external doors to terrace. Bungalow 1) 35m2 to rear of main house, twin beds, ensuite, kitchenette, Air conditioning. Bungalow 2) 45m2 to front of main house, double bed, ensuite, kitchenette, Air conditioning. Daily cleaning available on request. Final clean for a one week stay is 425 €. For durations of two weeks, the clean after the first week is 425 € and the final clean after two weeks is 425 €, total 850 €.